It’s in the place of desperation and devastation that hope becomes vital and real. When life seems to spin out of control and we feel powerless to fight. When dreams burst like a balloon, we get hurt, or loved ones pass away. There is a word, a person who is able to lift us up, to breathe life into us, to give us HOPE. When Jesus came into the world, He came to bring hope. He came to show us how we can get rid of sin, how to be free, how to live in peace, and how to reach eternity in heaven. That’s why it’s called the Good News. In Sri Lanka, our ambition is to print the Good News in every language, for every tribe, and to send it to any country possible. We want to see the Good News bring life and hope to people – something only God’s Word can do. A couple of years ago a pastor went through a village with the Gospel of Mark that had been printed in our Sri Lankan plant. Meeting a woman on the way, he invited her to a literacy class. What he didn’t know was that the lady was on her way to commit suicide at a nearby lake that very day. At his invitation she decided to give the class a try. The Gospel is one of the first books of literature the class reads after learning how to read. Her life changed when she learned about Jesus, who brought hope into her devastated life. For 34 years, New Life Literature has been committed to printing Christian literature and helping mission groups fulfill the Great Commission to reach the ends of the earth with the Gospel. We print Bibles, New Testaments, Gospels, and discipleship materials. Having the print shop in Sri Lanka, we are strategically located to reach Asia and Africa in the 10/40 window. We work together with Bible translators and mission organizations who are dedicated to bring God’s Word to any region of the world. Friendships and partnerships are growing. Our goal is to print good quality materials for a low and fair price. We have seen an increase of requests over the last years, to the point that we are not able to keep up with the demand. 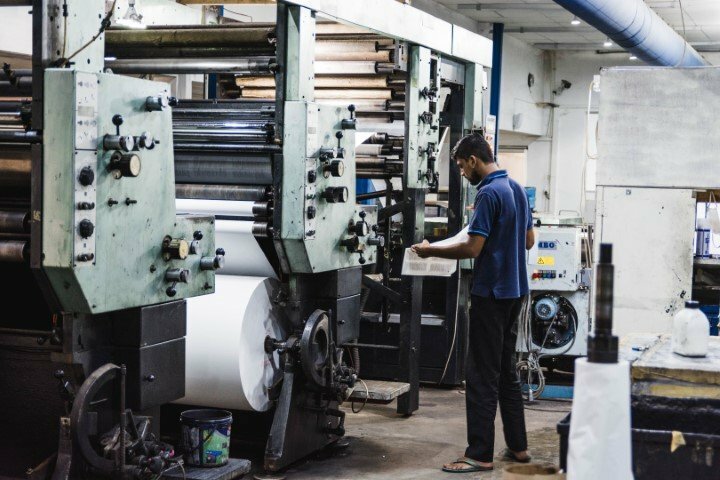 Our presses are 40 years old and require frequent maintenance, which increases our production costs and can lead to interruptions in completing our assignments. Our aim and prayer is to purchase a newer press that will reduce breakdowns and increase the speed of operation. The kind of press we are looking for has a capacity of 20.000 signatures per hour compared to the current speed of 7.000 – 9.000. This would be a huge step forward in our goal to provide hope to the world through the power His Word. During this month of ADVENTGIVE would you consider being a part of the goal to provide many more Bibles to the world? Right now, every dollar given is matched by a giving partner! Link to the opportunity HERE.